FalconSAT-5, is a microsatellite developed in the Department of Astronautics that will carry United States Air Force Academy (USAFA) Physics Department scientific payloads into space. The payloads that are currently intended to be flown on FS5 are Ion Source, Wafer-Integrated Spectrometer (WISPERS), Smart Miniaturized ElectroStatic Analyzer (SmartMESA), and Reciever UHF/VHF Signal Strength (RUSS). Ion Source is a payload resembling that of the Flight heritage Ion Source from Air Force Research Laboratories (AFRL). WISPERS measure ions resulting from ion source to validate USAFA and AFRL/PR plume models. SmartMESA detects the temperature and density of ambient ions to validate ionospheric data assimilation models. RUSS, receives UHF/VHF Signal Strength meter, and characterizes UHF/VHF signal distortion to improve ionospheric models. The FalconSAT-5 team has already completed its Conceptual Design Review and has already met key milestones in the development of the small satellite. 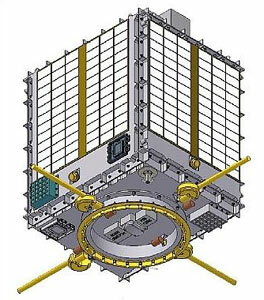 The Satellite is currently manifested to launch sometime during the Fall of 2009. FS5 will have two processors sharing the responsibilities. One will deal with the science payloads that are taking data to characterize the ionosphere. The other will do the computations associated with the sensors and actuators used for satellite attitude determination and control. Interface systems with these components will be designed by cadets. The FalconSAT-5 Attitude Control and Determination System (ADCS) has an active control method, magnetorquers, and a passive control method, the gravity gradient boom. To determine attitude a magnetometer measures the Earth's magnetic field around the satellite and compares the measurements to a model of the magnetic field, and four sun sensors detect the sun vector. The boom is stowed in a box that has to fit inside of the satellite during the launch. Because FS5 could launch on either a Minotaur or an Atlas, the interface to the rocket must be flat. After launch and orbit insertion the magnetometer and magnetorquers will damp out rotation rates until the satellite is spinning slow enough to deploy the boom. An internal configuration changes the characteristics of the gravity gradient control only slightly from those of FalconSAT-3. With FS5 serving as the prototype, the technological leap to FalconSAT-4 (FS4), which is a more advanced system, will be already mapped out. FS5 is launching before FS4 because some design constraints on FS4 made FS5 more marketable to finding its way on a launch manifest earlier than FS4.